Need durable, quality markers for your project? check out the Prismacolor Color Markers 6 pack! Prismacolor is known for their durable, high quality markers for artists. 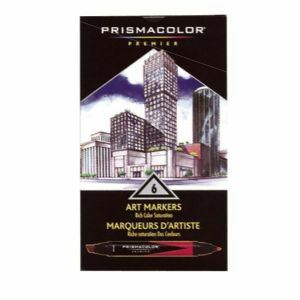 Whether you draw up architectural designs, create your own canvas art or are a student who needs them for the perfect project, these markers will make your designs and artwork leap off the page. These silky smooth, double ended markers make your project perfect with tips that won't feather or fade. With a chisel tip on one end and a fine tip on the other, it's great for professionals and students alike, allowing for multiple applications. Both sides use alcohol, dye based ink from a single resevoir, so your color always matches, no matter which end you use. Expect perfectly smooth, accurate lines, each and every time. The 6 pack colors are; Canary Yellow, Crimson Red,Dark Green, Ultramarine, Black and Violet. Non-toxic.